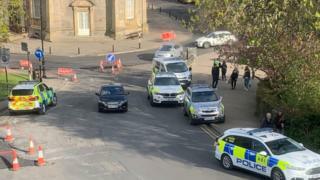 Two teenage boys have been taken to hospital after a serious assault in a Harrogate park, and two other boys arrested. North Yorkshire Police were called to Valley Gardens at 15:30 BST on Saturday to reports the teenagers were injured. The Yorkshire Air Ambulance landed in the park, and armed police cordoned off the area for several hours. The two boys remain in a stable condition in hospital. Unconfirmed reports said they had been stabbed. Police said two teenage boys from the Leeds area were arrested on Saturday evening in connection with the attacks, and remain in police custody. Valley Drive and Valley Gardens remained cordoned off on Sunday while investigations continued. Det Ch Insp Dave Ellis, of North Yorkshire Police, said: "I understand this incident may cause some concern in the local community. "However, at this time we are not looking for anyone else in connection with this incident. "Local officers will be in Harrogate today, as inquiries continue, and to provide reassurance to the public."